As a member of Brown Rudnick’s executive management team, Mark O’Leary is responsible for the firm’s overall financial strategy and execution. Working with the firm’s CEO and Management Committee, Mark develops business strategies to drive strong monthly business performance and long term growth. He is responsible for general operational and administrative services, marketing and business development, facilities management, benefits, intake, and finance. 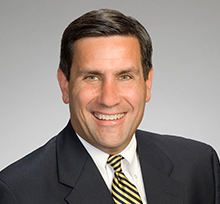 Prior to joining Brown Rudnick, Mark was the Controller at Ropes & Gray LLP, a national law firm with over 850 lawyers and six offices. Prior to that, he was the CFO at Fitzgerald Communications LLC, where in March 2002, he successfully negotiated and closed the sale of the company to Omnicom Group.